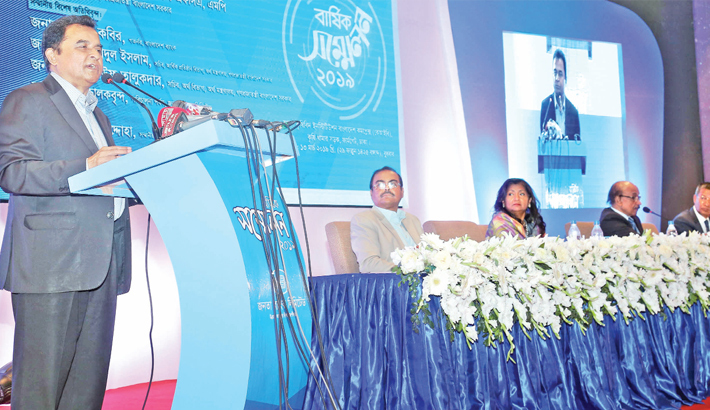 Finance Minister Mustafa Kamal speaks at the annual conference of Janata Bank at Krishibid Institution, Bangladesh in the capital on Wednesday. Finance Minister Mustafa Kamal on Wednesday highlighted the urgency for ensuring good governance in the country’s banking sector so that none, even the board of directors, can use the financial institutions for personal interests. The finance minister made the observation while addressing the annual conference of state-run Janata Bank at Krishibid Institution Bangladesh in the capital expressing his annoyance against the growing non-performing loan. Kamal directed the banks’ board members to uphold the dignity of the institutions and warned them not to use the financial institutions as their gambling field. The outstanding NPL of banking sector stood at Tk 99,911 crore which is almost 10.30 percent of the total lending amount of Tk Tk 9, 11,430 crore as of December last year. Besides, the central bank brought flexibility in right off regulation in February last to bring the NPL figure in acceptable level. Finance Minister urged the bankers to adopt new technology like – block chain to introduce comprehensive service under a single umbrella. Considering the rising trend of NPL, Bangladesh Bank Governor Fazle Kabir said the bad loan is not only challenges for the state-run banks but also for the whole banking sector. The governor directed the bankers to sit with top defaulters to discuss the problems and fix the issue in consulting with the central bank. Finance Division Secretary Abdur Rauf Taluk Abdur Rouf Talukder, Financial Institution Secretary Asadul Islam and Janata Bank Managing Director Abdus Salam Azad spoke among others while Janata Bank Chairman Luna Shamsuddoha presided over the meeting.